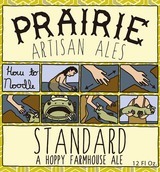 Prairie Standard is a hoppy farmhouse ale. This beer is a light, crisp, golden ale fermented with Prairie's farmhouse yeast. Standard is hopped with New Zealand hops, adding a citrusy flavor and arome.